Ever since the first medical photograph was taken at a French hospital in 1840, photography has played a major role in the healthcare industry. Medical photographs are used in various areas such as clinical documentation, research, publication and education. Hundreds of thousands of clinical photographs are produced each year in the health sector and it's becoming increasingly crucial to manage these images effectively and safely. Lisa Fisher from Medialogix, a FotoWare partner in the UK, shares how FotoWare Digital Asset Management helps the medical industry take care of their assets and even reduce the risk of financial penalties! Who are you and what is your role at Medlalogix? I have been part of the Medialogix team since April 2018 in my role as Business Development Manager, working primarily within the health sector. Previously I worked as a Clinical Photographer within the NHS for 19 years, the last 9 years of which, were as the manager of a Medical Illustration Department. I am very familiar with the challenges and requirements of image management and the governance of highly sensitive clinical images. I have always been an advocate of secure and effective workflows within my previous role and within the wider clinical photography profession and I am now able to influence this further through promotion of DAM and Medialogix products to provide a comprehensive solution to NHS and health sector clients. What kind of customers do you have in the healthcare industry? Our NHS clients are currently all Medical Illustration departments, where FotoWare DAM is employed for the management and viewing of clinical photographs taken by professional clinical photographers, doctors and allied health staff. Clinical photographs of patients are routinely taken to assist with diagnosis, monitor progress, plan treatment and provide educational material. Hundreds of thousands of clinical photographs are produced each year and the requirement for effective management of these images continues to increase with the development of technology. Having worked in the hospital environment for so many years I also see opportunities for centralizing image management resources for other departments using ‘standalone’ storage and image capture devices. How has FotoWare DAM solved the problems with management of clinical photographs? Prior to using DAM, clinical photographs were managed via manual processes which stemmed from traditional film photography procedures used prior to the advent of digital photography. Patient details were documented in paper books, spreadsheets or job databases and kept separate from the photographs. Digital photographs were printed out and inserted in paper case notes with very ineffective (if any) controls in place to prevent unauthorized access, copying and distribution. There were multiple margins for error and loss to occur and quite often, prints were missing from patient notes and were either unavailable for patient care or filed after patients had been discharged. With the growth and availability of digital photography, timely availability of clinical photographs often did not meet requirements, a problem exacerbated due to reduced staffing and increased workload pressures. Employing FotoWare DAM has completely modernized the workflow of clinical photography and has enabled strict governance procedures to achieve legal compliance in terms of Data Protection and GDPR. Due to improved workflow, photographs are now available at the point of care, risks are minimized through proper control of access and the availability of full audit trails of activity. Printed photographs are only rarely required which minimizes the risk of loss and unauthorized viewing. Patient details, diagnosis and consent provide useful metadata as the basis for processing images. What are the most common problems that prospective customers in the healthcare sector are experiencing without a DAM? Without a DAM, customers are still employing labor intensive systems in an attempt to manage digital assets using manual processes. Proper control over access to images cannot be achieved and many photographs are still unavailable at the point of care. I have heard of many ‘halfway systems’ in place where digital photographs are being printed, then scanned back into Electronic Patient Records (EPR’s) – literally doubling the workload! When photographs are required for teaching, doctors are putting them on USB sticks and taking images home to process and import into documents – there is no audit trail! It is well known that many doctors and allied health staff are taking photographs on personal mobile phones which poses many security risks due to images being stored on personal cloud services outside of the EEA which breaches the GDPR and DP laws. This also causes significant governance issues around the use, storage and availability of images. Image sharing via WhatsApp is also a growing problem. In response to this, many hospitals are now employing mobile devices for doctors and nurses in huge volumes of 300-500 at a time or allowing Bring Your Own Device (BYOD) systems with camera functions enabled. This requires the use of a DAM to ensure that resulting images and metadata are managed securely and centrally, making them available to those that are authorized to view them. I am aware that some hospitals are starting to employ EPR’s or radiology systems as a means of image storage. Although they do at least provide an image repository, they do not provide the specialist access controls required and sadly, the workflow process often generates additional work in an environment already under pressure. How does FotoWare Digital Asset Management help organizations in the healthcare industry? What are their main usages of DAM? FotoWare Digital Asset Management ensures full audit able control of clinical photographs via the configuration of several different control mechanisms based on: the medical specialty caring for the patient; the sensitivity of the images; the consent the patient has given regarding the use of their images. This configuration ensures that images are viewed on a ‘need to know basis’ and are processed in accordance with the patient’s permission. FotoWare also supports the upload of images from a variety of different sources, enabling integration with mobile phone Apps to ensure that even staff working in remote community locations have the same resource available to them. 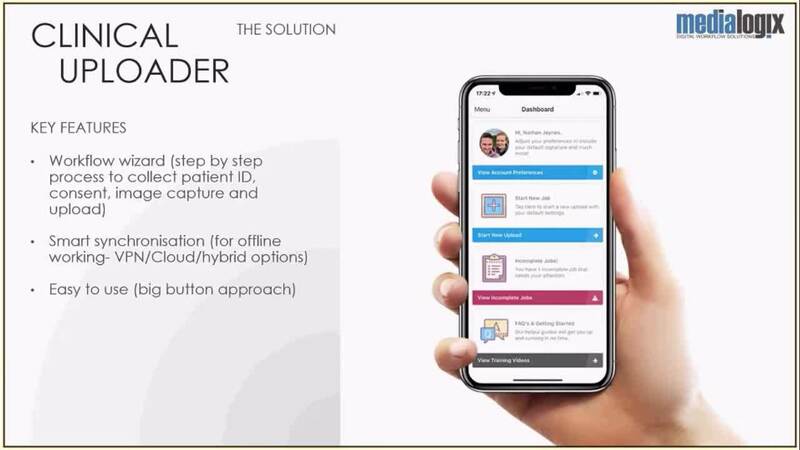 Medialogix have recently developed a secure Clinical Uploader App which can be integrated with FotoWare DAM so that images and metadata are imported and processed automatically, ensuring they are managed securely within the centralized DAM process. The DAM solution can be the primary image viewing interface, or it can be used in conjunction with an EPR to provide seamless availability with the proper access controls in place. The workflow for image processing is immediate, intuitive, automated where appropriate and reduces the administration burden of clinical photographers and clinicians alike. How can organizations in the health sector identify whether they need a DAM solution? 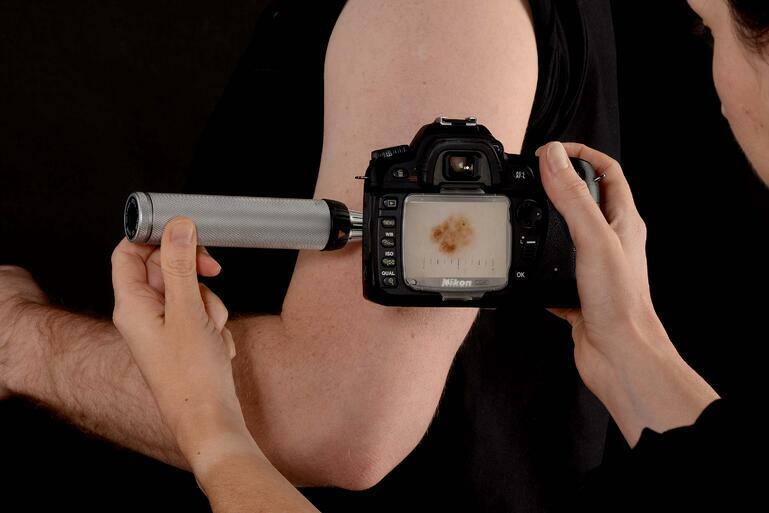 If they take clinical photographs they need a solution! How can organizations in the health sector determine what the return on investment is for a DAM system? The return on investment is both quantitative and qualitative. Images are available at the point of care, enhancing the patient pathway. Workflow efficiencies make better use of staff resources. Proper governance reduces the risk of significant financial penalties relating to breaches of legislation-the cost of a DAM solution is a fraction of a potential penalty!